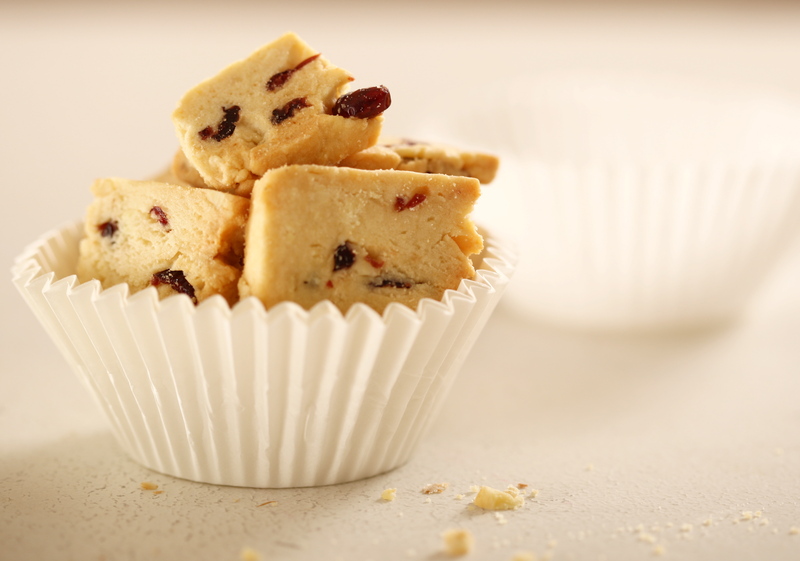 Cranberries are used in this sablé cookie recipe because of its high nutrient and antioxidant content. You can also use walnuts, hazelnuts or macadamia nuts instead of almonds. Cream butter, salt, and sugar on medium speed for 10 minutes until fluffy. Add egg and vanilla essence over 6 minutes on medium speed. Premix all the dry ingredients and add to above on slow speed for 30 seconds. Add almonds nibs and dried cranberries on slow speed and mix for 30 seconds. Transfer the cookie dough onto a tray lined with plastic. Compact it on the tray until 2 cm high and place in freezer for a few hours for it to harden. Cut dough into 3 cm wide and 6 mm thick. Bake at 180 °C for 12 - 15 minutes.